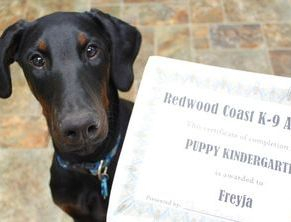 "Training dogs and their owners through positive reinforcement"
Janna Campillo, a Veterinary Technician, has partnered with Ferndale and Fortuna Veterinary to create and establish the Redwood Coast K9 Academy. 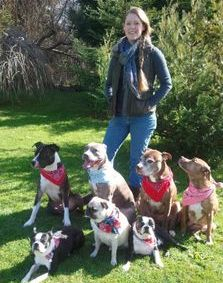 Janna has experience working with dogs in both the medical and training field for over 10 years. 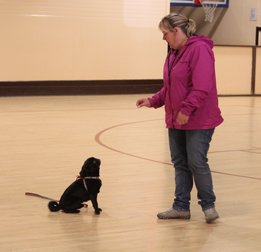 Janna strives not only to teach her canine students, but her human students as well, the importance of proper socialization, basic obedience, and impulse control. Young or old, education is the foundation for a happy, healthy relationship with you and your dog! Janna offers free consultations (with pre-enrollment) before classes begin. This provides one-on-one time for Janna to get to know you and your dog. Janna will also utilize this time to discuss any behavioral challenges and any goals you wish to achieve with your companion. Clicker training is an operant conditioning method for training an animal using a clicker or small mechanical noisemaker, as a marker for behavior. The method uses positive reinforcement and it is highly reward based. The clicker is used during the acquisition phase of training a new behavior, to allow the animal to rapidly identify that a behavior is sought and also the precise behavior of interest. 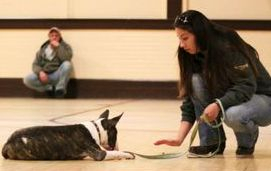 Private classes may be better for some dogs. If your dog is aggressive towards other dogs or people, or if you have a very specific problem you would like to address, private training may be a better option for your dog. If you are unsure if your dog would benefit from private or public classes, please call ahead of time and we can set up a consultation to get the right fit for your dog. * If you would like to do private training or address a specific issue with your pet, there is a $40 consultation fee. Contact Janna today if you would like to set up a consultation for your pet. Consultations are free with pre-enrollment into a group class. If you would like to do private training or address a specific issue with your pet, there is a $40 consultation fee. Thank you for contacting the Redwood Coast K9 Academy. Janna will be in contact with you as soon as possible!